You carefully sow seeds into perfectly moistened soil. 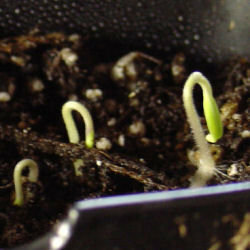 You check them seven times a day until the first green sprout arches its way above the soil. Ooh, the excitement as tiny green leaves unfurl and seedlings grow taller. Then, suddenly, disaster! The bushels of tomatoes and bouquets of flowers dancing in your head have been wiped out in an instant by The Dreaded Damping-Off. What is it, and how can you prevent it? Damping-off is a term used for a variety of fungal problems that lead to sudden seedling death. 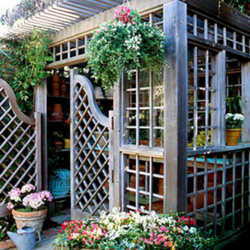 Beginners and experienced gardeners alike are frustrated and disheartened when it strikes. 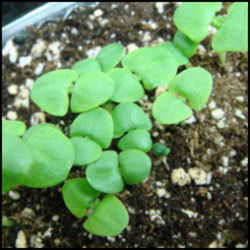 The pathogens attack the tender stems and roots of the seedlings. 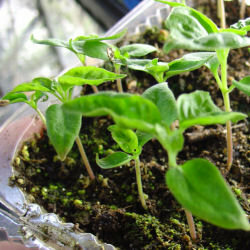 Some seedlings look pinched at the base of the stem, others flop over, and some wither away entirely. Once the process is underway, it’s hard to save even a few of your plants. Prevention is the best cure. Sterilizing your seed starting mix reduces fungal spores and other troublemakers. Commercial seed starting mix isn’t necessarily sterile, especially once the bag has been opened. You can sterilize potting mix in the oven, using pans or roasting bags with a thermometer to monitor internal temperature. Veteran seed starter Weezingreens advises heating the mix in a 200 degree (F) oven to an internal temperature of 180-200 degrees (F) for 30 minutes . Baking potting mix does have a certain odor that many people (or their spouses) object to. I like using the microwave. I discovered the hard way that the potting mix must be moist . Add 1 cup of water per quart or two of dry, soil-less mix. Work out any lumps or chunks of compressed mix. Additions such as moisture crystals, extra perlite, and time-release fertilizer pellets can be mixed in before microwaving. Put the mix into a microwave safe container with lid. I put my mix into a huge Tupperware bowl that holds nearly 2 gallons, but any microwave safe container with a lid will work. Cover loosely, and microwave on high for 8 to 12 minutes, until you see steam condensing in droplets on the underside of the lid. Close the lid tightly and allow the mix to steam at least 10 more minutes as the mix begins to cool. Steaming the potting mix also seems to “open up” the peat moss or coir so it absorbs water more readily. Although it won’t be strictly sterile once you start fooling with it, unused mix can be sealed up for later use. Put that sterile potting mix into clean planting containers. If you’re reusing containers, clean them first with soapy water and bleach. Wet conditions can promote damping off. Don't overwater. 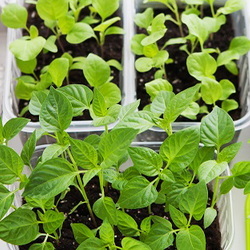 Keeping your potting mix barely moist rather than soggy is essential to healthy seedlings. 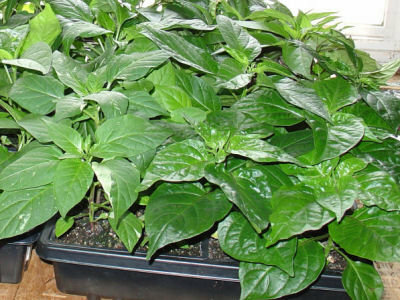 If you water from the top, water between rows of seedlings and try not to drench the tops of the plants. Bottom watering seems to help by keeping the soil surface a bit drier, also. Pour water into a tray containing the seedling pots, and let them soak up as much as they can through the holes in the bottom of the pots. After 15 minutes, pour off any excess so plants don't sit in water. Good air circulation helps prevent damping off. I’m always tempted to cram as many plants as possible onto my light shelves, but overcrowding limits air flow. A fan placed near your plants helps to keep the air moving. Many people recommend removing germination domes and other covers as soon as seeds germinate or doing without covers altogether. I put lots of little ventilation holes in the plastic domes for my trays. The holes allow some air flow and keep the humidity from getting too high. I do remove the domes once seedlings have several sturdy sets of leaves. Watering or misting seedlings with an antifungal solution will also help protect your seedlings. One tablespoon of 3% hydrogen peroxide per quart of water is sufficient. You can also brew strong chamomile tea and add an ounce or two per quart of water. A one-time dusting of cinnamon or powdered charcoal on the soil surface can also be used as an antifungal agent. Adding a top layer of chopped sphagnum moss, sand, or chick grit may help discourage fungi from growing on the surface of your potting mix. If you have persistent problems with damping off, you may need to consider a chemical control such as Captan, but such measures shouldn’t be necessary for most home growers. Sterilize your seed starting mix. Minimize wet conditions, and maximize air flow. Add an anti-fungal agent to your water. These steps will go a long way toward preventing the Dreaded Damping Off, and you’ll have healthy seedlings to set out this spring! Tom Clothier's Garden Site has some excellent information and advice about damping off. See his Damping-off FAQ page. Weezingreens is a DGer from Alaska who starts thousands of seedlings in her basement each year. She gives excellent advice in the DG Propagation Forum (subscribers only), on this damping off thread and elsewhere. If you'd like a laugh, click on the link to my Fire in the Hole! 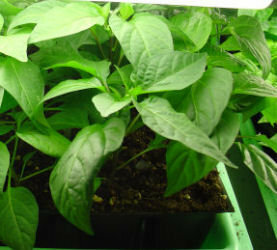 thread in the Propagation Forum.